There's this show on Sunday nights on the BBC Channel called Killing Eve. It's just unbelievably good. This desk bound MI5 agent suddenly gets reassigned to a special unit trying to track a shadowy assassin. 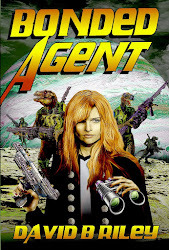 This is like a high octane spy movie such as the Borne movies, but the main character is this shadowy female assassin. I have always liked stories with female villains. Boy this one is on a level I have rarely seen. I thought this was going to be just another ho hum British murder mystery, but it's way beyond that. Watch this show if you haven't. There is nothing on Sunday nights even half this good. Still no word on a release date for Hotel Haunted. My editing stuff is done. The cover is ready. But the publisher has not decided when it's coming out or at least has not informed me of when it's coming out. Well, as I understand it, Ford is getting out of the car business. They're only going to make the Mustang and the Fiesta. They've always been kind of a truck company that sells a few cars. Now they've given up. Cars aren't as profitable as trucks and SUV's. Gotta have more profit. I'm not happy. Almost every car I've owned was a Ford [that includes a Lincoln Continental I once had] I've had four Taurus cars and currently drive a Fusion. So, unless I want to drive around in a gas guzzling truck, it looks like my next car will be a Toyota. I'm not happy about this. Not happy at all. I had lunch at the coffee shop I sometimes eat at yesterday. They're just down the street from my eye doctor and my kidney specialist, so I stop by there sometimes. I actually started going there when I was doing physical therapy earlier this year. Seems so long ago. Anyway, I often sit at the back counter where the loser customers hang out. Sometimes you overhear some fascinating things. As the snowbirds go back to whatever hellhole they came from and the college kids open their textbooks for the first time as they're starting final exams, the place is all but deserted. Since there aren't many customers to talk about, I don't get to overhear what the severs think about them. I still wonder what they say about me. My favorite server quit and left. We had some interesting conversations. I miss her. But it is a high turnover business--amazingly high turnover. I thought the hotels I used to work at were bad--nothing like the restaurant biz. Old timers are measured in months, not years of employment. One common thread is low wages. People just don't earn enough so it's hard to fault them for leaving. . So, to my surprise and delight a very attractive young lady seated herself at the counter. She had a very short skirt on and emerald green eyes. She seemed to know one of the waitresses. I gathered she'd just gone to the Grand Canyon Caverns. It's not easy for me to talk to total strangers. I'm actually rather shy. But, this was different. "Hi, I couldn't help but overhear you went to the Grand Canyon Caverns." "I don't mean to bother you. I'm a writer and I'm working on a book on haunted places in Arizona [true]." She relaxed a little. "Oh?" "Did you have any unusual experiences there? Strange apparitions, voices, feelings of being watched?" I asked. "No." She said. "Nothing like that." "Oh. Well, I've heard of things but never been there so I was curious," I said. Well, at this point I realized my food was consumed and hers was just arriving. I didn't want to be a pest. Yet, she was absolutely gorgeous even if she was ridiculously young for a geezer like me. "Are you really a writer?" she asked. "Yes. I belong to the Horror Writers Association, we do the Stoker Awards, and to Science Fiction Writers of America." I handed her one of my writer business cards and told her I had edited a fiction book of haunted hotel stories that was supposed to come out in about two months, but was working on some non fiction.. At that point I departed and let her eat her lunch. I wanted to stay, but felt like I would be a pest if I remained. Maybe she'll buy my book. It did give me something to talk to her about, if only briefly. Her waitress friend seemed glad I finally left. I kid you not. Read yesterday's post about my middle name of Bryan if you didn't catch it. . Last night I got a call from some collection agency looking for Bryan. I wondered if this was legit and someone had stolen my identity or at least the messed up identity being used by the medical world. Nope. The last guy who used my phone number was Bryan. How's that for a coincidence. And he's got a collection agency after him. I hate collection agencies. They have a role to play--but they never seem to update their records. I'll probably get calls for Bryan for years. What will Bryan do next? He must be a real person. It says so on my medical chart. My name isn't Bryan dagnabbit. Who the Hell is Bryan? I've mentioned before that I hate being forced to use my middle name. It's on my health insurance, driver license, voter registration, the deed to my house and probably other things as well. I have always wanted to be known as David B. Riley. I have never wanted to be Bryan anything. Yet I have to put David Bryan R---- down on stuff like voter registration because that's what it says on my ID. Now my doctor's office has started calling me Bryan. The health care worker came out to get me yesterday and called for Bryan. No one responded. She went back into their inner sanctum, then returned a few minutes later and called for David. I responded then--not that they won't do it again. There are many things that baffle me. Around Tucson, hardly any Chinese restaurant offers fried won tons--especially the kind stuffed with meat. A few have won ton soup. I've never understood why that is. 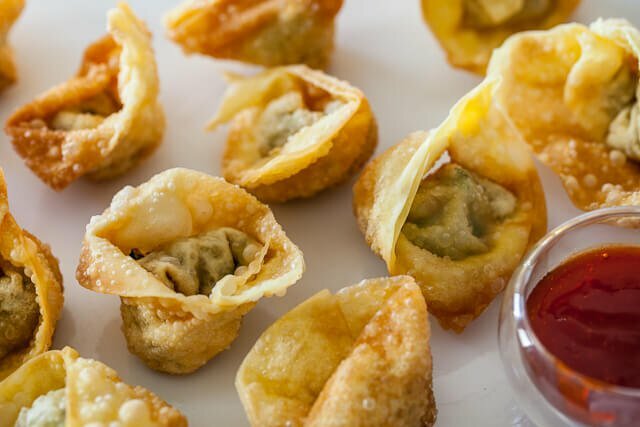 If I want fried won ton the way you could readily buy it in San Francisco, I have to make it myself. It just doesn't seem to exist around here. There's some crab thing the restaurants seem to think is better and that's usually the only variant you can get. Bees are in trouble. Some scientists blame pesticides, others think it's some kind of mite. But they clearly are in decline. I was trimming a bush in my yard yesterday--which has little purple flowers. I discovered a small bee hive growing inside it. And the bees were not happy that I was trimming the bush. Okay, Plan B. What is plan B? I've never had this happen before. I put a cardboard box under the hive and knocked it down. I then placed said box in the trunk of my car. I drove down the street to a large parcel of desert land and put the hive inside another bush. There they won't be bothering anyone. The amazing this was I did not get stung. I am one of the few people who has not seen Game of Thrones. I haven't seen an episode, let alone the entire series. Why is that? Don't know, really. Perhaps I simply lack interest. And I don't get HBO. I do know they were having a free look at HBO special which was designed for binge viewing of things like GOT. I thought I'd see what all the fuss was about. I tried watching a couple of episodes. Alas, I kept falling asleep. I still have not seen an entire episode of Game of Thrones. I recently mentioned our wind has been so ferocious that it carried away a can full of tree trimmings, saving me from having to cart them down to the dumpster. Yesterday's wind was even worse. I actually was afraid another of my trees was going to be destroyed. Miraculously, the trees survived. It's not always easy to come up with things to post here. My life just isn't that exciting. I thought my tree trimmings story was amusing but but no one seemed to like it. Sunday I cut up a dead tree I had in my yard and I trimmed a few bushes and cut them up. I had a trash bucket that was full of plant parts. I went to bed and thought nothing else of it. Monday was a windy day and I still didn't think much of it until I went to the back yard to get my plant trimmings to take to the dumpster. They were gone. The wind had blown them away. There was no sign of them. I don't know where my trimmings ended up. I do know they're gone and someone is probably pissed . Well, it was God's will. I didn't do it. I just put them in the can. I didn't scurt them away to places unknown. I note the passing of R. Lee Ermy, the lovable retired marine who appeared in a number of roles during an acting career that began when he left the corps. In particular, he played the father of bounty hunter Brisco County Jr. That means he played a US Marshal who was murdered--inspiring his son to seek revenge. I'm not sure if he regretted that role. I seem to recall it was not credited in the actor credits. He had other more memorable parts. I note that particular role as I just loved that show. It was like a show made just for me. I met a woman once who was like the sister of a co-worker back in Colorado. Anyway, it was a get together at the sister's house and someone noted the boxed set of Brisoc was by the TV. What the hell is this? Someone asked. She started telling everyone about the show--which no one had seen except the sister because the visiting sister had to watch it back home. I joined in and started talking about Socrates Poole, the lawyer and the mysterious orbs and everyone else kind of went to another room. So, my newfound friend and I stayed up all night talking about Briscoe County Junior and some related shows like Legend. At six am the not visiting sister got up and was shocked to find us still in her living room talking. I would've gladly married this girl right then and there. I had found my soul mate. And she went back to Kansas and I go a polite postcard from her and never heard from her again. And that was that. So, when anything connected to that show comes up, such as the death of an even minor cast member [Ermy only appeared twice as I recall] I tend to rattle on about it--like now. Have a nice day..
Well, it's not looking good on the convention front. I continue to get snubbed by cons. It looks like I won't be attending many this year. I'll be at Westercon in July because we have a dealer table. It doesn't look like I'll be doing any programming stuff. Then there's Mile Hi Con in October. I've attended this thing almost every year. Not sure if I want to go back to Colorado. a second time this year. And that's about it right now. Survived Friday the 13th. Nothing of consequence happened yesterday. My car battery went out two days ago. They don't give you any warning. I was able to get it going with a jump and went and bought a new battery. It would've been a lot easier to deal with if I'd known there was a problem. At least I wasn't 50 miles out in the desert somewhere when it failed. There's a coffee shop I eat at now and then. It's near the hospital. I started going in there when I was doing physical therapy. I'm no longer doing therapy, but I still eat there now and then. It's one of those places that has a counter in back for the losers to sit at and not waste space taking up an entire table. I usually sit there. Thing is, you're right back where waitresses hang out. You can easily hear what they say about the customers. Frankly, they're pretty brutal. I wonder what they say about me when I'm not right there. Yesterday, some supposedlycute guy came in. One of the waitresses is trying to fix another waitress up with this guy. I wasn't too impressed--the guy had that serial killer look, but nobody asked me. Alas, the waitress they're trying to fix up is very nice and young enough I could be her grandfather. So, I''m not going to hit on her. The young waitress wasn't too impressed. I doubt she slipped him her phone number. But you never know. I had scrambled eggs and toast. It was good. I live in a community where there are a lot of retired people. Some of them seem like they're always travelling. "Next week we're off to Jamaica." Or "We just got back from Scotland." I don't know when I last had a true vacation where I relaxed on warm beaches and ladies in grass skirts brought colorful beverages....that sort of thing. Now I don't begrudge my neighbors for taking vacations. I simply lament my lack of them. And postcards. Nobody ever sends me postcards when they go anywhere. Maybe someday I'll find a little extra money and sail off to some distant land. But not today. Sigh. 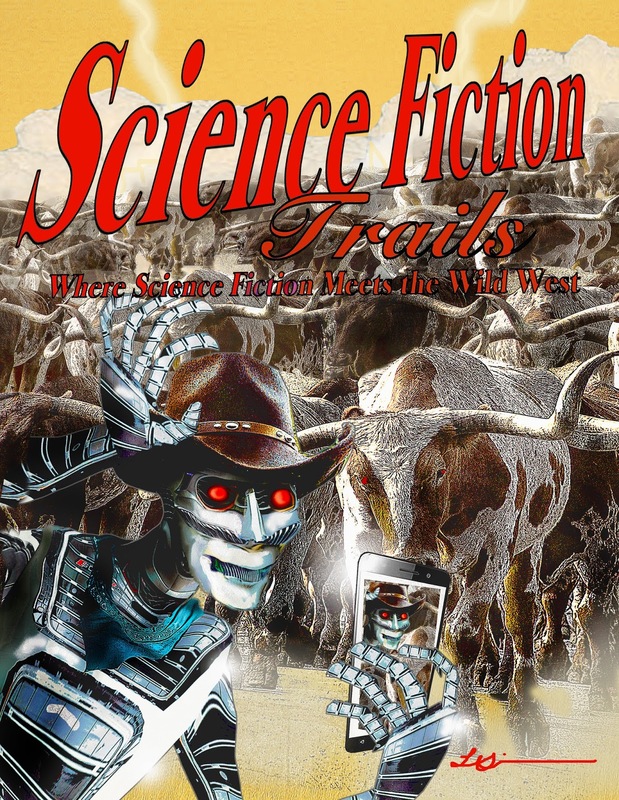 And the ebook for Science Fiction Trails 13 is now available from Kindle. By the way, that's all there is. We aren't doing any other ebook channels than Kindle. Some of my other books are on other venues. They never sell. And we've found distributors like Smashwords are simply more trouble to deal with than they are worth. That's my opinion anyway. We do sell enough Kindle copies to make it worthwhile. The western ghost anthology Gunslingers & Ghost Stories has sold quite well on Kindle. So that's about it out of Science Fiction Trails Publishing for 2018. We have no other projects planned. I'm going to concentrate on my own writing for now. The haunted hotel ghost anthology should be out in a few months, but that's published by Wolfsinger and not an SFT product. The print edition is up for sale on Amazon and will shortly be available on other outlets. The ebook version will come out next week if all goes according to plan. 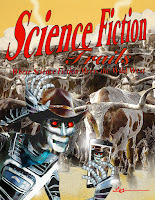 The new issue of Science Fiction Trails will go on sale tomorrow. Before everyone starts fighting to order a copy, I thought I'd mention issue 13 For starters, Laura Givens did the cover. 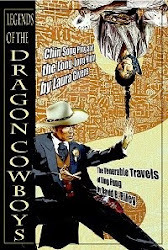 It contains stories by Sam Knight, Henry Ram, J A. Campbell, Sam Kepfield and more. There is an ebook and those tend to take an extra week or so. Back about six or seven years ago, at the hotel I used to work at in Colorado a customer got a call from the front desk around 7 am informing him his Amex card was bad. Furthermore, the front desk politely asked if he could come over as soon as possible. Well, the poor guy got dressed and came over to see what was wrong. And the agent at the front desk smiled and said "April Fools." And his wife and kids started laughing. And then he realized the longstanding tradition of getting him on April Fools Day was alive and well. I was the front desk agent. The family had asked me the night before to do the joke on him. I had very reluctantly agreed. If the victim had gotten mad I could have been fired, The family could have turned the joke on me and denied any knowledge. But they didn't. They went off to breakfast as happy as can be. In fact, they left me a $20 "Tip" when they checked out of the hotel. So, they had their fun. All was well. I've played April Fools Day jokes on people over the years. Strangely, the one person I never play jokes on is my father. His birthday is on April Fools Day. I thought he'd be great when I was young and learning about the concept. But my mother wisely counseled me otherwise. My father has absolutely no sense of humor. He doesn't know what's funny and what's not. So we didn't play April Fools on him. I got my brother quite a few times. In fact, I quit doing him as it was just too easy. The thrill was gone. I doubt I'll do anyone this year. I've given up. I've thought about doing them to writers, during an editing cycle for an anthology I could send an acceptance on April First--followed by a "you;ve got to be kidding" rejection. But that seemed a little cruel and I never did it. So, happy April Fools Day to all and to all a good night.